Have you ever started a hobby project, but life and its twists and turns got in the way? You never quite forget that you wanted to complete the project, and you hold on to the basic components for years – in this case thirty years. 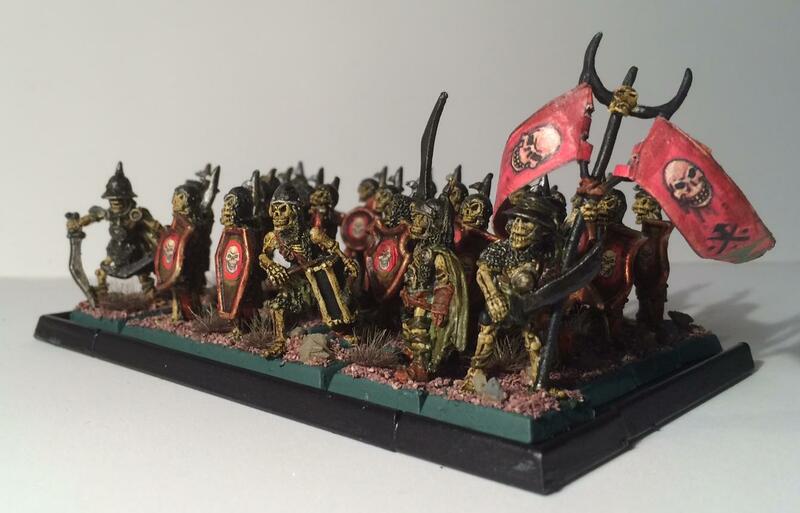 This is the story of my painting of the “Nightmare Legion”, and my return to painting and wargaming with miniatures. 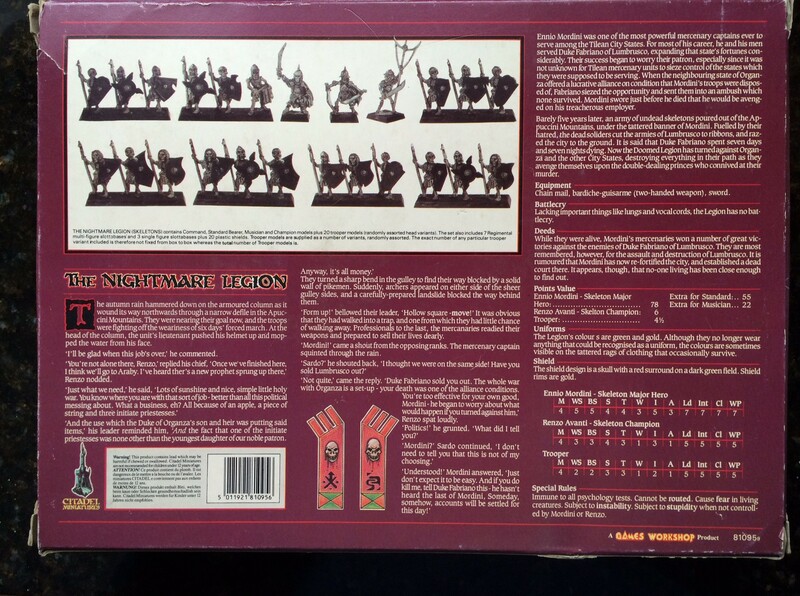 To begin, I would have to go back to my years at West Point (1980-1984), where my roommate Dave Wood and his fellow Michigander John “Buck” Surdu (’85) introduced me to miniature wargaming. I was familiar with all the old Avalon Hill Board games such as Waterloo, Afrika Korps, Panzer Leader, War at Sea, and Victory in the Pacific – and Dave and I played all those plus Risk and numerous Steve Jackson card games. Then Dave introduced me to Buck – who ran a neat Tunnels and Trolls game as a DM. Later on, I would DM one with Dave, Buck, and Ken Thrasher. At some point on a Saturday Buck and Dave brought me up to the Department of Foreign Languages building where all the desks were pushed together with an Army OD blanket covering them creating a battlefield bigger than any board game could ever be. 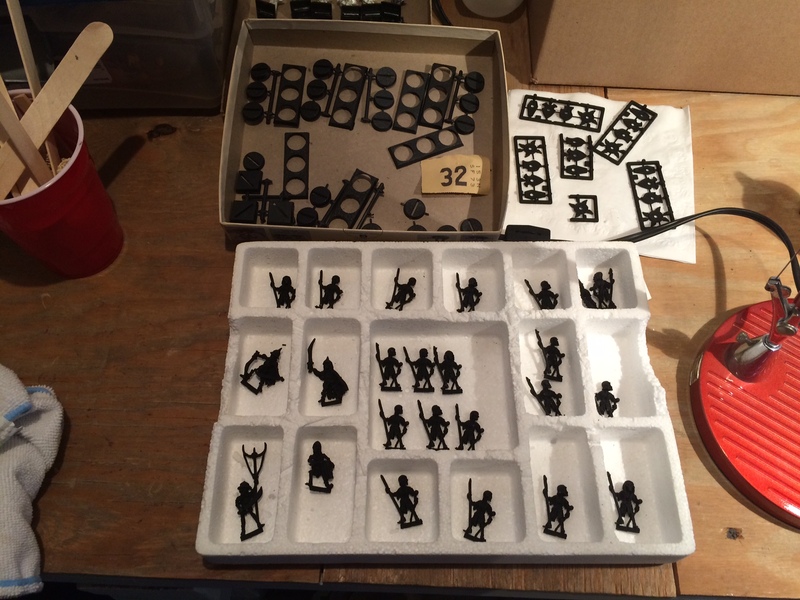 Representations of terrain were there – as were my first look at miniatures. These were fantasy ones – something like you would have seen at the Battle of the Five Armies. It was so cool. I had been a huge fan of Tolkien, and this was unlike anything I had ever seen in gaming. I remember the battle was played out by some rules written by Buck, and I was hooked. That led to my wanting to paint myself, and I even bought molds to create my own units and individuals. Even after graduation, I remember getting games together in Italy and Germany while we were stationed there. I really looked forward to these. 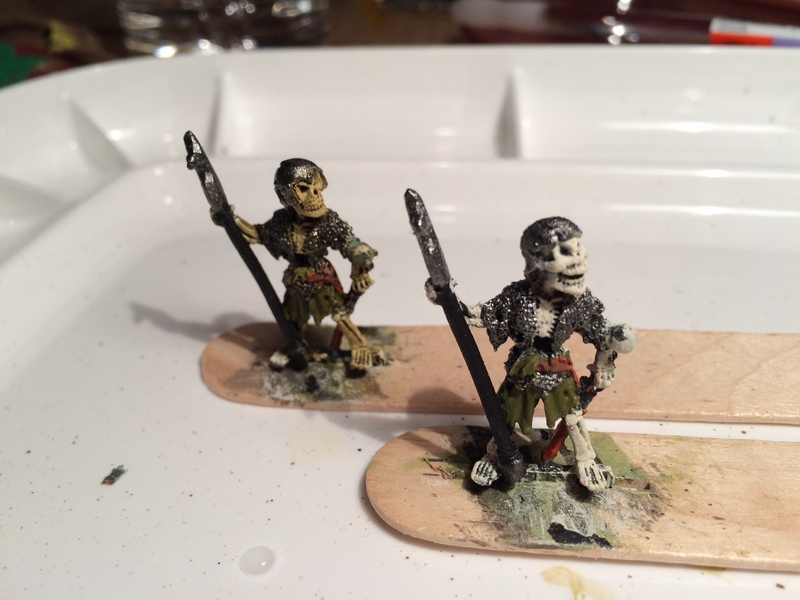 At some point while still at West Point I bought some Ral Partha skeletons and learned how to use the dry brushing technique. I had skeleton units! They were cool too! I was on leave at a hobby store in Massachusetts (I think the now-defunct Eric Fuchs Hobbies in Burlington, MA?) 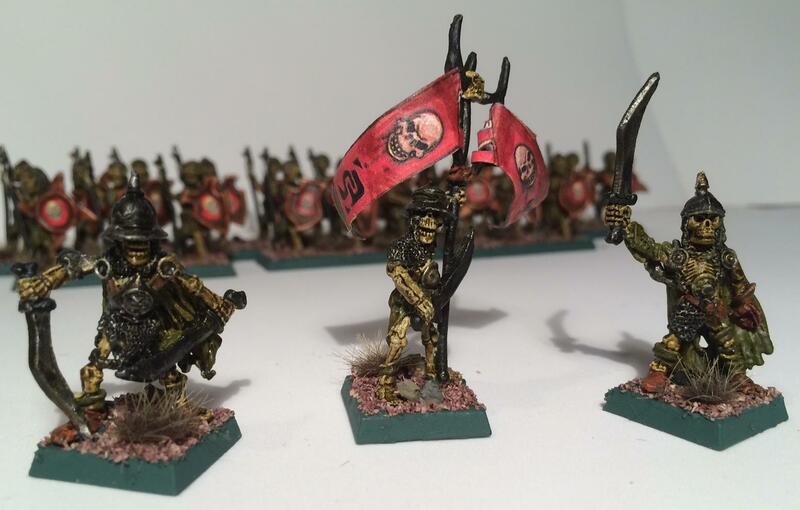 when I saw a Citadel box with an entire skeleton regiment, I had to have them! (My guess is that would have been around 1984). I forget what I paid, but I think it was my most expensive miniature purchase at that point! It was called the “Nightmare Legion”. It included 24 figures, including a standard bearer, a champion, a drummer, and a leader. I remember priming them in black, putting them back in the box, and basically never getting back around to them (life is funny that way). While I played a few games in the 1990’s, I really only painted some Greek infantry and cavalry for a diorama project that my daughter Ellen and I worked on together around 1999. I had them stored with all my other unpainted and painted miniatures in an old metal cabinet in the cellar. In 2010 we had a mishap (ok, a fire) where my fireplace chimney flue failed and caused smoke damage and ultimately a new chimney. This necessitated getting rid of a lot of stuff in the cellar, including the metal cabinets. My wife Lynn said that I had “too much junk” in the cellar, but I managed to hold on to my cabinet of miniatures and paint (dating back up to 30 years old). However, with the price of heating the house getting ridiculous in the winter, we switched to gas in 2013. Out went the metal cabinets, and my miniatures ended up in another pile in the cellar. Fast forward to the fall of 2014, and I cleaned the cellar and cleared my workbench. I decided that I would now renew my hobby as I saw all the miniatures that I had bought and never got around to painting. I also thought it would be cool to tell the story of this unit – which traveled in its box to West Point NY, Fitchburg, MA, Ozark, AL, Asilomar, CA, Ft. Belvoir, VA, Hagenbach West Germany, and then Fitchburg, MA again, Irmo, SC, Forest, MS, Hubbardston, MA, and finally East Brookfield, MA! So now to the project – here is what they looked like when I started (well, restarted – I primed them in the first Reagan Administration). After 30 years – daylight! So I took Buck’s suggestion on using popsicle sticks as bases but used my Dremel to cut a slot so the figures would stay on the sticks – you can see them below with a Ral Partha Wizard that I added to keep the sticks even – I will post more on him when he is finished. The base coat was Polly S Interior Green mixed with some Polly S Sahara Sand (probably bought the paints in the mid ‘80’s as well). The polearms (called “bardiche-guisarme” on the box) were painted with Tamiya Gun Metal. The heroes were armed with one or two swords. The base coat was Polly S (remember Polly S before Testors bought it out?) Interior Green mixed with some Polly S Sahara Sand (I probably bought the paints in the mid ‘80’s as well). I drybrushed the bony parts with Americana Bleached Sand. The result was not really what you would expect from bone – it was too white. However, using a wash with “Sewer Water” from Secret Weapons Washes yielded a nice effect as shown below. I thought the bones looked like they were dug from the earth. You can see a nub on the figures left arm – this is where the shields were to be attached. Looking at the box covers, Citadel said that the colors of the remaining uniforms were green, with gold and green on the shields. 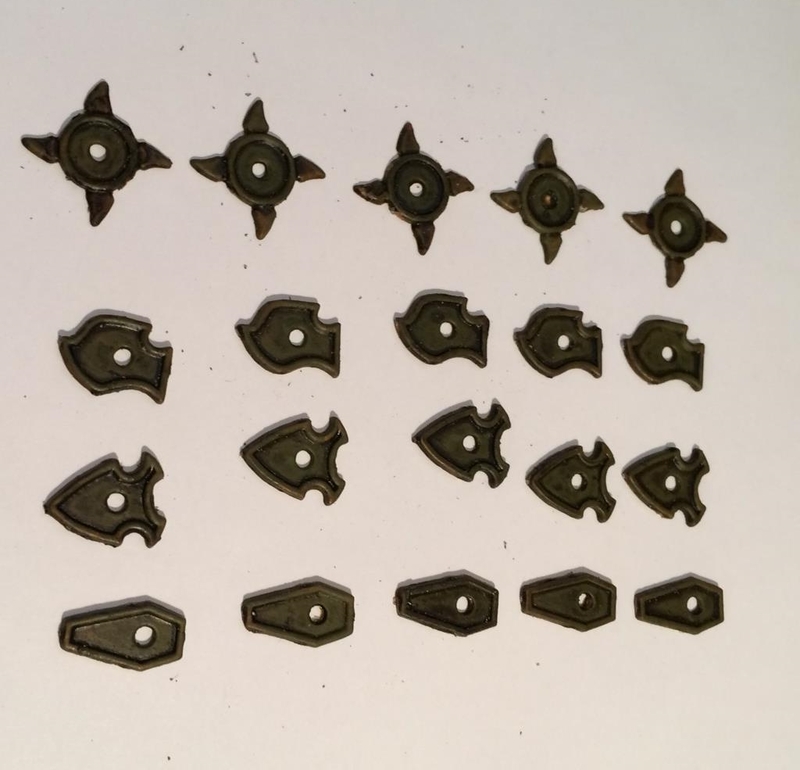 The shields needed to be cropped so that the metal was flush with the outside edge – however there were no skulls in the kit to adorn the shields – which left me in a quandary. As you can see below, the shields are painted and attached and the nub removed, but I am not happy with the color – it seemed too gold for a unit from the grave. 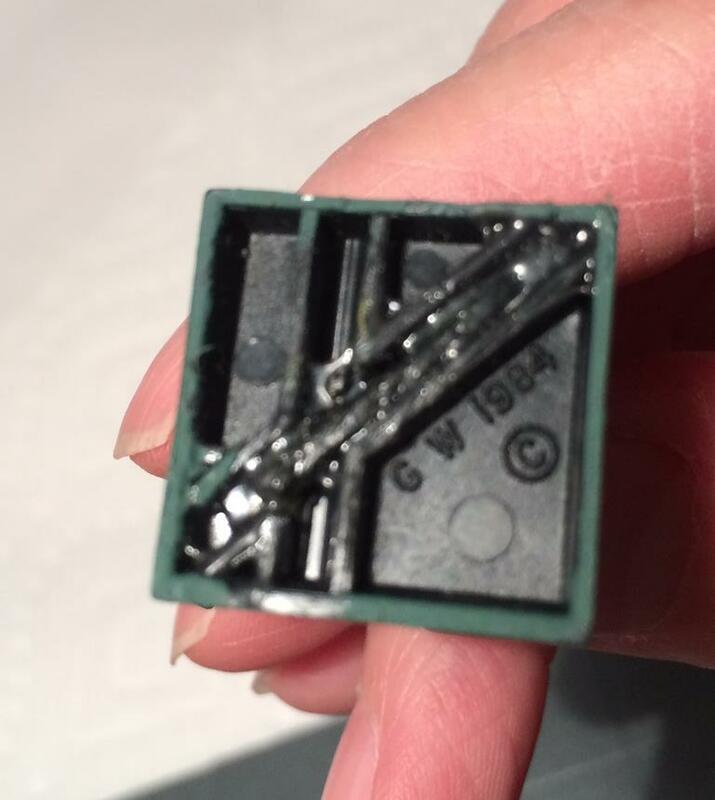 Also, what to do about the appearance of the center nub? Golden & green shields with a metal nub? Thankfully, I have a tool that did not exist in 1984 – my color HP printer. 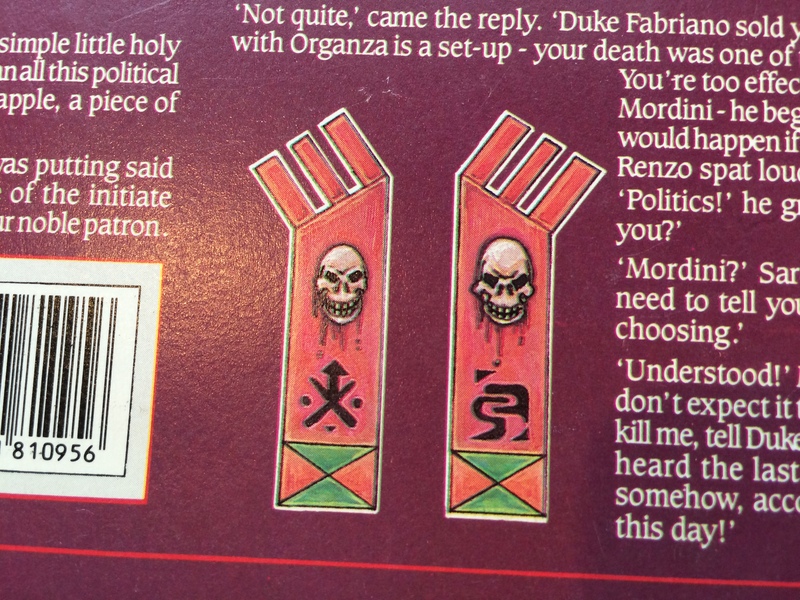 Using that, I copied the back of the box for the skulls on the cover. I then measured the size and compared the size to the space available on the shield – and reduced them until I had a good size. I painted a red circle or oval on the shields with Armory red (left over from the mid-‘90’s Greek project). 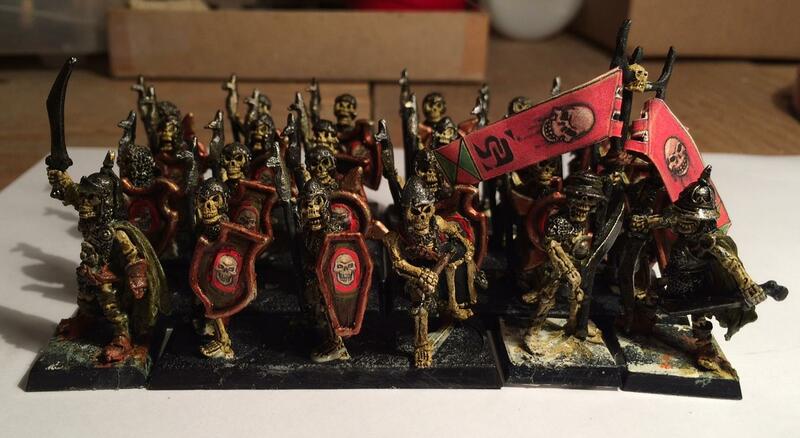 I then cut out the skulls and affixed them to the shields. I then coated the paper lightly with wood glue to protect the skulls. I then darkened the shield borders with Tamiya Metallic Gray. This was better, but still not to my liking. I then used P3 Brown ink to shade the metal on the shields and it gave me the effect that I wanted – dull, rusty looking metal on the shields. 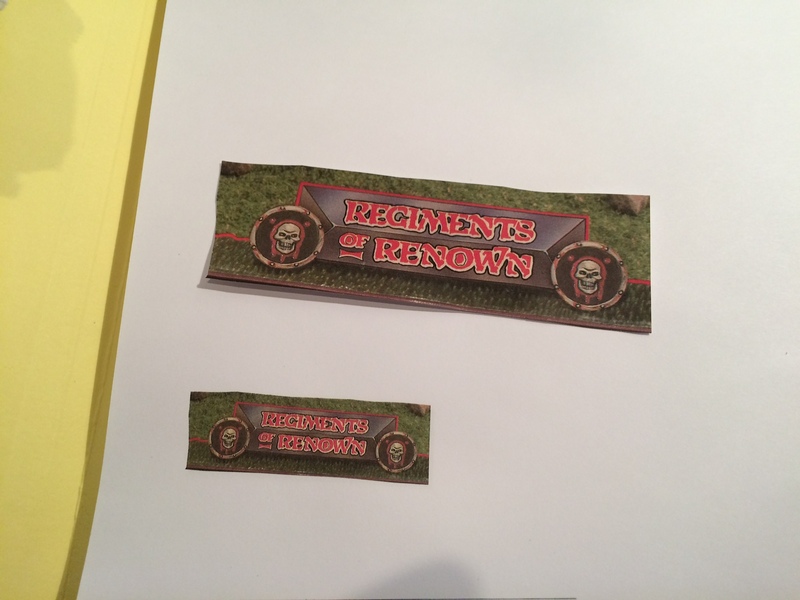 Creating the battle standard was a puzzle – and I ended up using the HP printer again. I had to cut the banner out of the box as the printer would not copy it well otherwise. I hated destroying a piece of the box but I saved the cutout and can recreate the banner again if I need to do so later. I cut the banner and applied it to the standard bearer with wood glue. I stained the back of it (it was printed on regular paper) with the P3 Brown Ink and lightly coated it on both sides with wood glue. This yielded two benefits. First, it caused the two-piece banner to curl as if being in the wind and second protected it from damage from the final varnish. Then I prepared the base with Polly S Jungle Green and gave the entire unit a light coat of Krylon Matte varnish. The last steps involved the bases. I have never used flocking before but I wanted to use some on this unit for sure. I used wood glue to apply Army Painter Brown Battlefield flocking. I then added multiple Army Painter Battlefield Rocks painted with a selection of Apple Barrel Pewter Gray, Armory Flat Black, or Polly S Sahara Sand. I then firmed all the flocking up by applying a glue and water slurry. The last step was to add Wasteland Tuft by Army Painter. Class picture – Nightmare Legion completed and ready for battle! I thought it useful to build a transport card as well (in black). I am so happy that this is done – perhaps it helped me keep my mind off of the 110” of snow we got in February! Interestingly, these are available unpainted on eBay for a price (up to $250 for a set!). 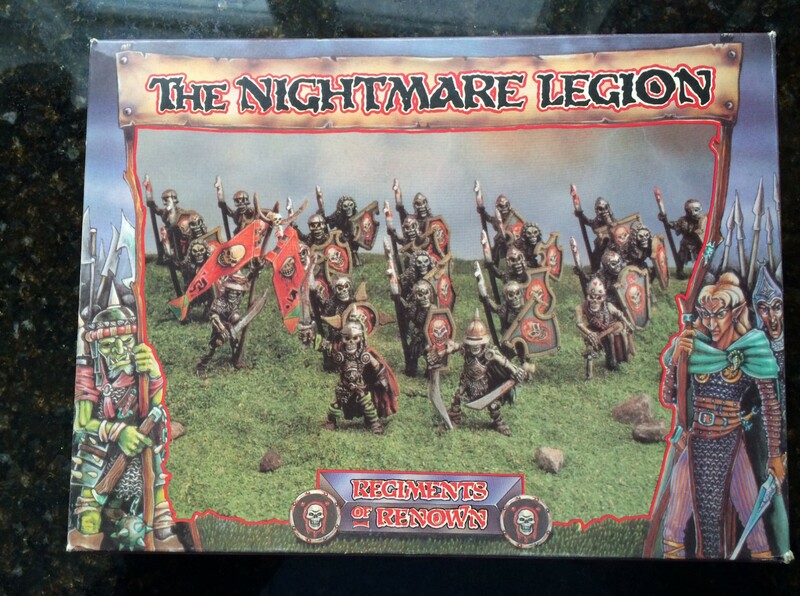 Finally, after 30 years, I have the Nightmare Legion in my collection! This is my new blog site – well, my only blog site. I will see how this goes, and hope my friends find this interesting. Author Mark A. MorinPosted on March 16, 2015 March 19, 2015 Categories Personal2 Comments on Hello world!